Redundancy is the key to high uptime and zero defects in pharmaceutical-labeling system. SPS Phin manufactures process-line labeling equipment for clients in a variety of industries, including the pharmaceutical industry. Phin's clients prefer to purchase a complete labeling solution, including print verification and label printing, in one package from one vendor. That puts Phin in the position of needing to supply an optical-character-recognition/optical-character-verification (OCR/OCV) system integrated with its label-printing equipment. The company did not want to add specialized machine-vision technology at the level needed to design a robust OCR/OCV system to be integrated with the rest of the label-printing system. Consequently, it sought a partner to supply an OEM print-inspection system that could be offered as an option with the label-printing equipment. Hugh McCrie, general manager of SPS Phin, says his company decided on a standard OCR/OCV solution offered by Cognex. We've been involved with Cognex directly or through integrators for some time now, McCrie reports, and have developed confidence in its ability to provide products and solutions that are going to work for many years. Cognex ProofRead is a combined hardware and software OCR/OCV solution that the company can supply either in board-level trim, fully integrated with the components mounted in an enclosure with built-in keyboard and touch-screen monitor, or somewhere in-between. All the systems can support up to four cameras with lighting and optics. We needed a system to validate preprinted labels, as well as printing that we're doing in real time, McCrie points out. The information we print typically includes a drug-identification number (DIN) and always includes a date and lot code. The system also has to verify that the product-identification number (PIN) is there and correct. To do this, it not only uses OCR, but also interfaces to the rest of the system to verify that the information we are printing matches the product going into the bottles. There are two label-printing subsystems in Phins SM 9000 ACLSS label-printing system, one of which is active and the other redundant. This redundancy allows the production line to keep going if there is a problem with either printer or should the active line run out of label stock. In the event of a problem with the active line, the system automatically can switch to the redundant line without interrupting production. Phins SM 9000 ACLSS label-printing system comprises redundant label printing, inspecting, and applying subsystems serving a common conveyor line, along with final inspection and bottle-rejection stations. Labels come to the printing system in rolls with decorative graphics and some product-specific information, such as the PIN, already applied. They come off the roll as a web and feed directly into the printer-a Dataflex Plus thermal overprinter manufactured by Videojet. The printer adds information, such as date and lot codes, and a DIN. After leaving the printer, each label goes past a Sony XCHR50 video camera and CLM-LDL-74X27N light bar made by Cognex, then to the label peeler/applicator, which separates the label from its backing and pastes it onto the next bottle coming down the conveyor. Each label-printing subsystem runs a web of labels attached to a backing tape. The web starts as a roll that spools past the print head and then the inspection camera before reaching the peeler/applicator. 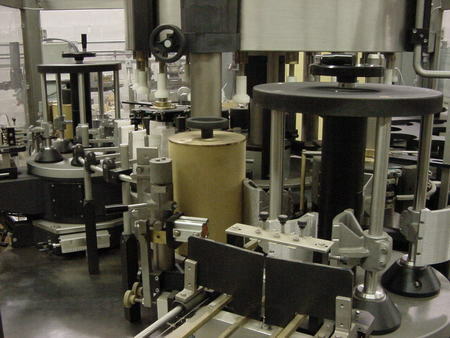 The peeler/applicator separates each label from the backing tape and press-applies it to the next bottle on the conveyor. The cameras output goes directly to a Cognex 8504 high-speed analog frame grabber, which acquires an image for the host computer, a Hewlett-Packard PS052UA industrial PC with touch screen that oversees the whole operation. This host computer provides the system interface to the factory network and runs the ProofRead OCR/OCV software. It also provides supervisory information to control the mechanisms through a Micrologix programmable logic controller manufactured by Allen-Bradley. The software can map out distortion and correct for it to read and verify the information. The Phin system inspects preprinted codes, as well as characters applied by the systems thermal printer. The host computer reads the label to make sure that what was printed matches what was supposed to be printed and that it is legible and placed in the right position on the label. There is, however, nothing that can be done at this stage about any misprints without breaking the web, and the rule is Never, ever break the web. Instead, the system keeps track of the incorrect label as it moves through the process. The next step is peeling the label from the backing and applying it to the bottle. Once a misprinted label is off the web, it can be removed from the process stream. However, the label is on a bottle, so removing the label means removing the bottle. Before taking that step, the system takes another look at the label to ensure it is removing a faulty package. If the final inspection confirms a faulty label, the PLC activates a Festo pneumatic plunger that pushes the misprinted package off the conveyor into a scrap bin. User interface works by soft keys displayed on the host computers touch screen. A tabbed window system allows users to configure the system, switch between predefined configurations for different products, monitor system operation, and call up historical results. The host computer provides the operator interface. The ProofRead system has soft keys displayed on its touch screen that allow an operator to highlight areas on an image for the system to concentrate on and that link those areas with variables representing the information that should go into those areas. The user interface also allows an operator to select performance parameters for the system to track and to prepare reports. These reports are essential in a regulated industry such as pharmaceuticals because companies are audited for compliance.